The news is buzzing with reports that Sarah Palin actually picked a primary winnner in virtually unknown Joe Miller, although the victory was a close call with only a couple thousands votes separating the winner from the loser, moderate Republican Senator Lisa Murkowski. I have mixed reviews regarding Murkowski but I definitely do not want one of Palin's picks to go to Washington and would prefer Murkowski to choose the Crist option and run independently from the two major political parties. 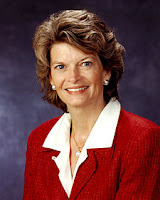 The reason why I would want to see a third-party run would be for two reasons - one would be to see just how many people vote for the teabagger Miller in comparison to the GOP "establishment" candidate (Murkowski). The other would be to break up an othewise GOP stranglehold on Alaska's senate seat to sort of counteract the loss of Ted Kennedy's seat in Massachusettes - the jury is still out on Scott Brown but I would currently prefer a Democrat over a moderate Republican for Alaska's representation (I fear the GOP is too cozy with Big Oil and their relationship will only spoil future meaningful energy and environmental legislation).